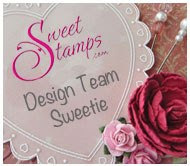 Today is our sixth challenge on the Sweet Stamps blog. into the challenge for a chance to win a $20 shopping spree. I'm still fairly new at card making, and decided to experiment with making different shaped cards. This card, as you can see, is cut short. Then with a matted image hanging over the front. I love tulips and I can't wait for my own tulips to start popping up! 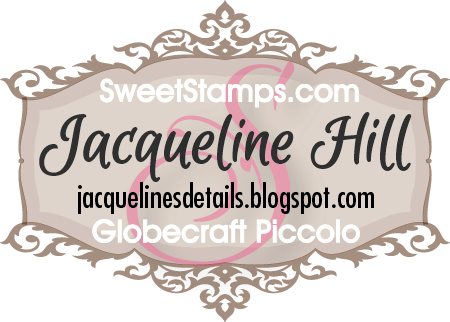 Below is an offer to get 10% off your order at Sweet Stamps! Your Tulip card is a positive sign of spring!!! I love your card and colors. Great job! Beautiful card Jackie! I love how you used an itty bitty background stamp and ink to create your own DP. Awesome coloring on the vellum, neat how you modified the square card! 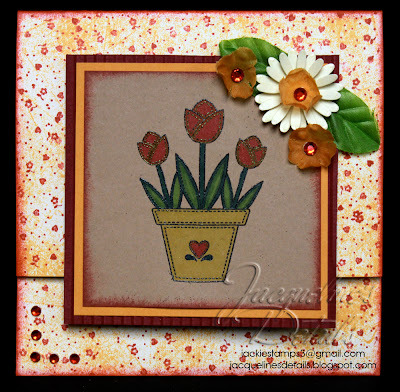 I love the colors you used for this card and how you colored the paper after stamping the background. I love tulips!! Love how you created your own backgroud paper!! Beautiful job! I also love tulips popping up everywhere. You have done a spectacular job with all the details on this beauty! So very cute! This is so bright and cheery! Your tulip card is wonderful! I love the colors you chose and the way you accented the frame with more flowers!! Great job!! Thanks for joining the WWUSA Spring Challenge this week! Wow, the background almost looks like designer paper (you had me fooled!) Thank you for joining us this week at Woodware USA!! Beautiful card. Love the background paper that you did and the colors you used. 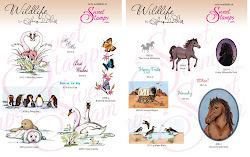 Jackie, what a wonderful Spring card, love the design.